Sian lost 87-pound weight after being "dumped on a romantic weekend getaway"
Sian Ryan was ready to start her weight loss journey in January 2015 but her attempts were failed: she lost twenty pounds at first but then she gained it back. Sian explained: "I was in a toxic relationship where we both loved to eat and drink a lot, without thinking about our health". Sian Ryan started her serious weight loss journey in September 2015 when her boyfriend dumped her on a romantic weekend. She nursed her broken heart and used the gym as a way to take her mind off of things. 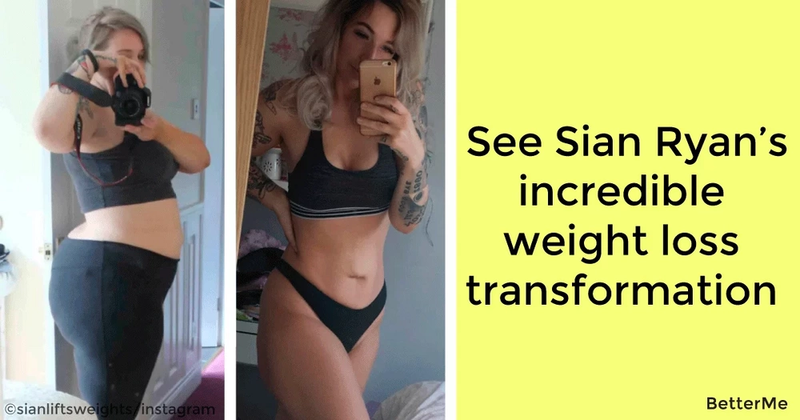 Sian began her body transformation at 261 pounds and now her weight is 174 pounds. Scroll below to see her typical menu, exercise plan and amazing photos of her transformation. When she broke up with her boyfriend she signed up for a free twelve-week training plan. Sian went to the gym every day of the week and that made her fall in love with weightlifting. Sian started to change her eating habits as she balanced her diet with veggies, fruits, proteins and complex carbs. She reduced her portions and her daily calorie intake to around 2 thousand calories. Sian became more experienced in slimming that is why her daily calorie consumption now is 1,700 calories. A high-protein diet and intermittent fasting help her stay fit. Sian starts her eating window at 12 p.m. and she finishes it at 8 p.m. Lunch: boiled chicken with greens, tomatoes and cucumbers. Snack: a cup of strawberries/ Greek-yogurt/ a couple of dark chocolate slices/ a handful of almonds. Dinner: an omelet with cheese, tomatoes, cucumbers, red peppers/protein shake/ protein bars. She says "Never give up! If you had a bad day you can just start it over. Our bad days build better days and although you cannot slim down in a week you should take small steps towards your dream." Remember one important thing, "Always be kind to your body."